Rabbits are small, non-hostile animals which are sometimes hunted by foxes and other predators. Their only defenses are their small profile and their speed. 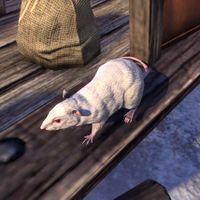 Rats are rodents common to all of Tamriel. They can be found both in city sewers and the wilderness, and are known to carry a variety of diseases. Rats are often kept by goblins for food. Pack rats can be trained to carry or drag items. Skeevers are much larger variants found commonly in Skyrim. Ravens are black carrion-eating birds. Witches often take the form of an enormous raven. A type of eel that can be found in Reaper's March. 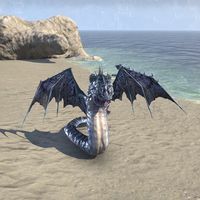 Reef Vipers, also known as Sea Adders, both terms which seem to be used interchangeably, are large, toothy, hostile, serpent-like ambush predators. They are an invasive species brought over by the Maormer and can be found from the beaches to the mountains of Summerset. The Maormer breed them to be obedient as well as bigger, smarter, and nastier than their wild counterpart. Lesser Sea Adders seem to refer to Reef Vipers of smaller sizes. They have a similar anatomy to Sep adders. Reindeer are a type of deer found in snowy climates. Due to their large size, they are sometimes used as mounts. Reindeer are traditionally associated with the festival of Saturalia. A type of shark that can be found in Vvardenfell. 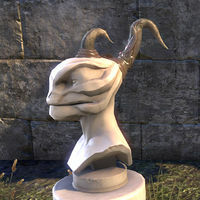 Argonian horns styled after the Rhinoceros. Rieklings are a race of small, blue-skinned humanoid creatures native to northern Solstheim. They are aggressive, and can be dangerous in groups. Despite being considered little more than beasts by the local Nords, Rieklings are naturally cunning. Some are intelligent enough to speak Cyrodilic, although they rarely say anything intelligible. Rieklings also have their own language. Apart from this, they have little culture of their own. They scavenge what few relics they can find from the other races, and form strange attachments to these treasures. Rieklings are known to use spears, lances, blades, shields and axes in combat. They often tame Tusked Bristlebacks, a native type of boar, for use as warmounts. They also have the ability to create simple traps to guard their lairs. Rieklings can be found wandering the wilds of Solstheim, in their lairs, or waiting in ambush for an unlucky traveler. They have a tribal society, often led by a chief. Members of the tribe are known as "tribe-kin". Rieklings can construct basic structures, such as tents, fences, bridges and lookout towers. They partake in ritualistic "Godspeak" ceremonies. 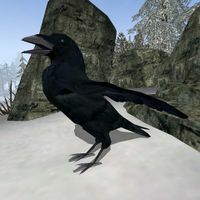 One such ceremony involves the use of Scathecraw, or "redgrass", a plant native to Vvardenfell which spread to southern Solstheim after the Red Year. Rieklings are fond of "dizzydrink", alcoholic beverages that they scavenge. The origins of Rieklings are a mystery to the people of Tamriel. The local Nords believe them to be descendants of the snow elves, related to the other elven races, but this claim is not supported by scholars. The Imperials consider them to be nothing more than "ice goblins". The Rieklings seemingly consider Solstheim to be the entire world "within great water", meaning that if any exist in other places, the Solstheim Riekling are not aware of them. 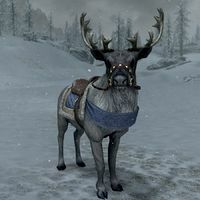 They commonly dwell in ice caves or remote locations, but they have been known to inhabit Dwemer and Nordic ruins as well. Rieklings were present on mainland Skyrim in the Second Era. In 2E 582, the Ice-Biter Tribe of rieklings attacked the town of Cragwallow in Eastmarch and were wiped out in retaliation. The Rieklings have a history of conflict with both the Nords and the local wildlife. 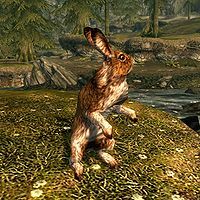 They are known to hunt wolves and torment the spriggans. The Skaal are attacked by them frequently. Karstaag the frost giant once employed Rieklings to guard his fortress, Castle Karstaag. When he was taken by werewolves to participate in Hircine's Hunt in 3E 427, a Riekling named Dulk took control of the castle in his master's absence. Dulk attempted to enlist the help of several grahls, but the creatures turned on the Rieklings and killed many of them. The grahls were killed by the Nerevarine and a Riekling named Krish. In 4E 201, a tribe of Rieklings attacked the mead hall at Thirsk and drove out the Nords. 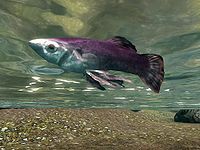 A purple fish commonly found in bodies of water around Tamriel. The fish is poisonous, making it useful in alchemy. Rootworms are creatures living in the Black Marsh that are commonly referred to as the "Underground Express", because of their ability to swallow travelers whole and carry them with the current. The digestive systems of rootworms are apparently quite slow, and travelers "could live in a rootworm's belly for months." 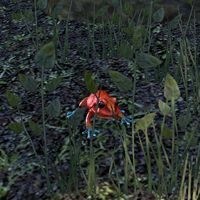 The Ruby Hopper is a rare species of Frog found in Murkmire. They are bright red in color and enjoy sunning themselves, however they are also very quick and are easily startled. Argonian vossa-satl makers use these frogs for their pleasing croaking sounds. This page was last modified on 2 January 2019, at 21:11.